One of my favorite things about blogging is the people you meet. OK, not actually "meet", but virtually speaking, you "get to know them" through their Blogs, their Twittering, their Face Book pages - you get my electronic drift. I've only been blogging, at this point, for about 3-4 months; yet I've already been in several Cooking Challenges (preparing certain recipes, certain ways, for a certain time), a Plateswap (sending a new plate to another blogger ala: Secret Santa style), and now "Blogging for a Cause." It's an honor to be invited to prepare a recipe that will help bring awareness to a place that has helped so many. 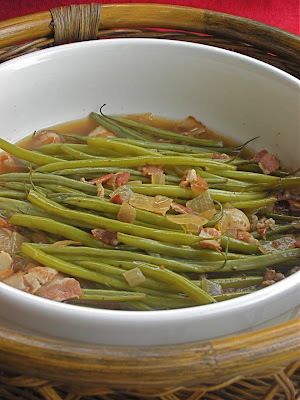 The recipe I prepared is called: Green Beans That Cooked "All Night". 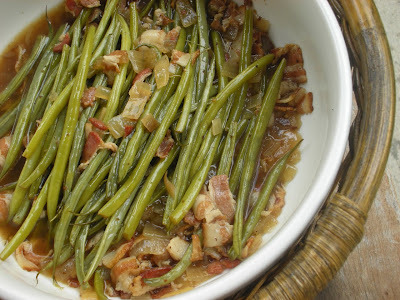 These Green Beans were slow-cooked (no fuss-unattended) in caramelized bacon, onions and tangy sauce. Can it get any easier or more flavorful? They reminded me of my Southern Grandma's Snap Beans cooked in Fat-Back and Onions. This is a perfect side-dish for a busy dinner (maybe Thanksgiving) when you need to prepare so much in so little time. Another plus; they taste even better the second day after the flavors have marinated. The recipe was chosen for me by Kelsey, The Naptime Chef. The idea is extremely clever; promote a new cookbook, Park Avenue's Potluck CELEBRATIONS (written by The Society of Memorial Sloan-Kettering Cancer Center and award-winning author and contributing New York Times columnist Florence Fabricant) by preparing recipes from the book and posting them like a virtual POTLUCK online. The cause is very worthy - "A portion of the proceeds from the sale of this book will provide funding for The Society's patient care, research, and education programs at Memorial Sloan-Kettering Cancer Center." To see the other beautiful and delicious foods that are a part of today's Park Avenue Potluck, check out The Naptime Chef. AND, order your copy of Park Avenue Potluck Celebrations: Entertaining at Home with New York's Savviest Hostesses " so you can actually taste these goodies for yourself - in the real world, real time, really. Place the bacon in a 3-quart saucepan over medium heat. Add the onion and cook until the bacon and onion are lightly browned. Stir in the beans, vinegar, and 1 cup water and bring to a simmer. Season to taste with salt and pepper. at least 2 hours, basting from time to time, until the beans are very tender. Serve immediately or remove from the oven and reheat just before serving. These are wonderful Cathy, thanks so much for you participation! That's just what I love about blogging too. A meetng ground beyond belief! Love what you made for the party. It's beautifully prepared. oh the green bean look fab nice to be having dinner with you! What a great idea all around. The book and cause sound wonderful. And those beans look super yummy. I don't meat normally but there are certain times when i just have to try - I think this is one of those. thanks for the dish! Ah bacon, sneaking into vegetables. Nothing better! These look great. Fun to see what you "Brought" and be introduced to your lovely blog! Mine didn't look nearly as pretty as yours when I made these on a week night last week. I was too impatient so I upped the temp to 300 and cooked covered for an hour so and then uncovered to reduce the liquid for another 15 or 20 minutes. Absolutely delicious with the "bacon vinaigrette"!